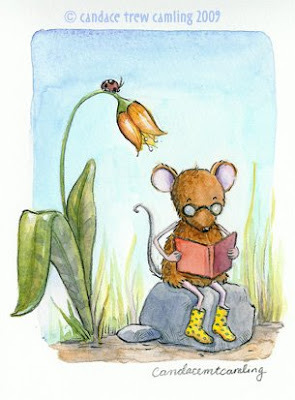 "Ladybug was climbing all the way up to the tallest flower to see what Mouse was reading." I did this in my Moleskine watercolor sketchbook today. I don't know that I am overly pleased with it, but it was nice to steal away a little time for myself. I have a lot of little projects going on right now, and most are not in my children's style. I got this done just in the knick of time! great illo! cute character! well done. Love it - the ladybird is a really nice touch. Super sweet! Love the yellow rain boots. i like to think the ladybug is climbing up and behind the mouse so as to surprise and devour. i love it and that you took time for yourself today. good for you! Very cute! It is nice to do something just for yourself every now and then! Good for you! so sweet! i love the plant! this illustration brings back memories of when I was a little girl, reading a children's book -- I think because when I look at your illustration there is such a story behind each character. it's lovely.